Maybe you have already thought about wearing contact lenses. Finger mit ClContact lenses are specifically customised for your individual eyes. To select the right lenses for you, it is important to establish how you intend to use them (e.g. in sports), for how long you will be wearing them and the individual qualities of your eyes. Because contact lenses are positioned directly on the eye, they are the closest alternative to organic vision and a natural look. Contact lenses are ideally suited for sporting activities. Contact lenses don’t get wet in the rain or fog up. The times stated concerning accustoming period, wearing rhythm and durability are based on experience and will differ depending on the wearer and eye properties. Our highly qualified team of experts will be able to determine which contact lenses are right for you. Come in to see us for a detailed consultation. 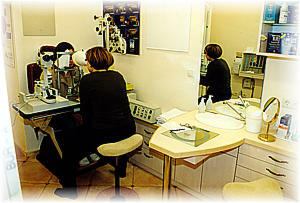 Our premises include a separate consultation and workshop room equipped with modern apparatus for contact-lens fitting. Would you like to test wearing contact lenses? We will be happy to fit lenses for you to wear for a test period of several hours. For your own safety and the well-being of your eyes, we recommend that you do not wear contact lenses without receiving a professional fitting first. Not only is a proper fit important, but so is the material used in lenses. Our experts will be sure to choose the right material for your particular tear properties, for your wearing needs and for your regular wearing environment. In the first fitting for new contact lenses, we will give you the ideal lenses for your eyes to test for several days. This will give you opportunity to familiarise yourself with using them. Our prices for first fitting covers a fitting charge as well as the purchasing price for the contact lenses. No fitting charge will be levied on follow-up orders. Regular follow-up controls (annually for rigid lenses and semi-annually for soft lenses) will ensure that the front sections of your eyes are periodically examined and that your lenses are inspected to ensure no deposits have accumulated on them and they show no signs of peripheral damage. There is a wide array of care products available on the market. Our fitting specialist will select the products you need for your particular lenses and your eyes. Always use the products recommended by the fitting specialist or discuss any changes in product with the specialist first. We offer an extensive selection of contact lenses and care products. In addition to standard products, our offering also includes less expensive alternative options produced by German manufacturers.